This version supersede the previous one that was posted in the thread entitled "Written in PowerBASIC for Windows". 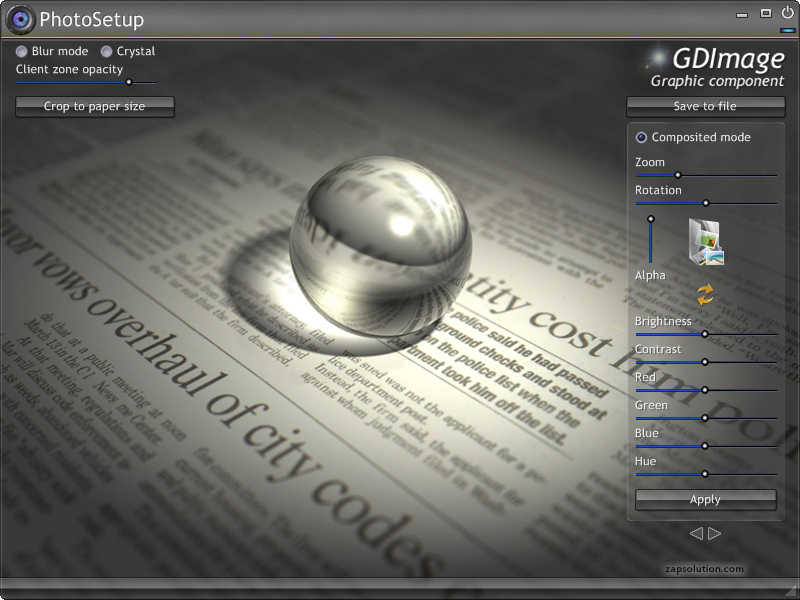 PhotoSetup is a GDImage project that allows you to edit the settings of your photography. It can also autocrop a photography to adjust its size to a standard photo paper of 152 x 102 mm. The ZI_FitImageToPaper API allows you to use another paper size, like 233 x 152 mm, if you want. Note: When using autocrop, GDImage checks for the orientation of the phototography to create the new cropped image in such a way that it best fit the paper size. You can figure how the image will fit into the default paper size of 152 x 102 mm, if you uncheck the "composited mode" and if the PhotoSetup window uses its default size of 800 x 600. 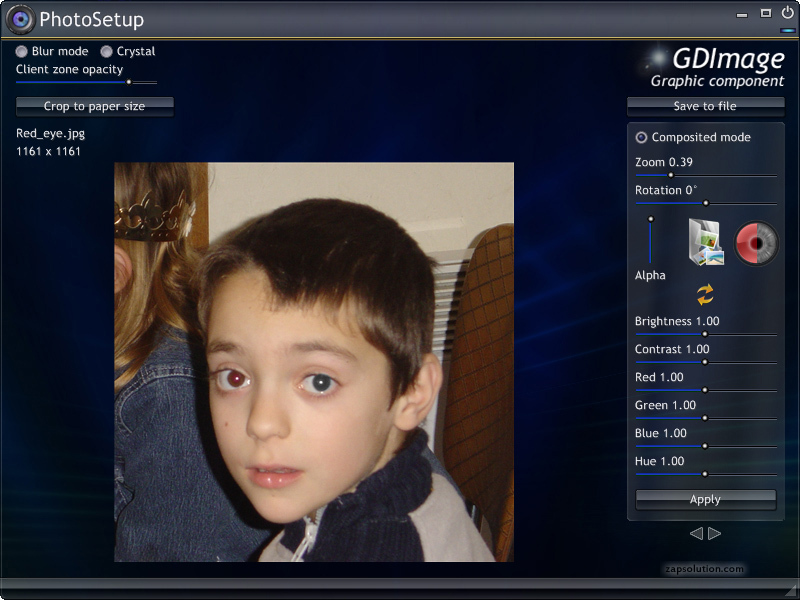 GDImage allows you to disabled a main window, while a child popup window is waiting for input. You can see it when you use the "Select a new picture" button, or when you use "Crop to paper size" or "Save to file". The disabled window becomes darker until the user complete the input. You can use drag and drop between the Windows Explorer and the PhotoSetup window to select a specific picture. TIP: to convert a picture to shade of gray set HUE to its minimum value. There are many backgrounds for you to try! thank you for another nice program! It looks great as usually. The problem with multiple settings is that they are cumulative, I am using the built-in PowerBASIC MAT to multiply my matrix, would be interresting to compare with the GDIPLUS matrix function to see which one is faster, so far i gived the credit to PB without checking first with GDI+ . Also it is important to consider that all drawings are antialiased, and that of course slowdowns the computation, but in that case i prefer to favor quality over speed. Just one thing - PB MAT commands are great for code clarity, and reasonably fast. But for hi-performance applications ( like TBGL module for ThinBasic, written in PB/WIN 8.04 ) I prefer own routines for matrix handling. They are usually much faster, as they are optimized for specific matrix size. PB routines are more powerful, but also more general, which means some speed impact. Key for speed in this case was usage of ARRAY ASSIGN, it is speed booster! However i didn't benchmark it against the PB's built-in MAT function. I shall make a test for comparison purpose and follow your advice of using "Array Assign". If you want to boost the preview settings, you can change this in the source code of PhotoSetup. Try with a value of 512 instead of 1024.
it works much faster now. In my case ARRAY ASSIGN doesn't make any difference. Attached is the GDImage.dll using Charles's code instead of the built-in PB MAT function. Note: While changing the settings, GDImage computes the new matrix in real time to update the display and the matching DIB section, not a trivial task as you could imagine. When you use the "APPLY" button the settings are frozen and thus zoom and rotation are working again at full speed. I am using cumulative effects directly on the real bitmap, and this would be of course much faster if i would use a smaller bitmap preview when building the initial ZI_FitBitmapFromFile. I am sorry my solution did not worked for you, I guess the 5x5 is too big. For 3x3 it had nice effect for me. Charles optimizations ... this is always great stuff! The PhotoSetup project has been updated to let you try the new "Remove red-eye" feature. The ZIP file is attached to the first post of this thread, and it is provided with a "red_eye.jpg" picture to play with. In this example, the right eye has been corrected while the other on the left is unchanged. To use it, click on the "Remove red-eye" button, then move the cursor hover the eye and use the ellipse to delimit the section (you can resize it using the rubber band). Once done click on the right mouse button to popup the contextual menu and select "Apply".